The Higgs Boson: Have Scientists Found the Mystery Particle? 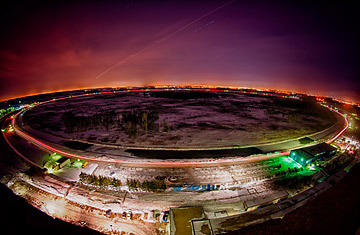 The Tevatron typically produces about 10 million proton-antiproton collisions per second. Not all that long ago, the Tevatron particle accelerator, about 30 miles west of Chicago, was the biggest, baddest atom smasher on the planet. It slammed protons and antiprotons together by the trillions at nearly the speed of light to discover some of high-energy physics' greatest hits, including the top quark a host of other new particles. But it shut down last fall after 28 years of operation, the victim of budget cuts, even as the newer and more powerful Large Hadron Collider, or LHC, began churning out its own discoveries over in Europe. But the Tevatron is still in the game, in a very big way: physicists analyzing data from some of the huge machine's final runs have uncovered evidence for the existence of the Higgs boson, a dreamed-of, talked-about, sought-after particle that has eluded physicists for more than 45 years. It's not the first evidence for the Higgs, which would tie the so-called Standard Model of Physics together with nice, tidy bow. It's not the strongest either: that came late last year, when scientists at the LHC announced an almost-but-not-quite detection that had the physics community humming. But the new findings are an independent, near-confirmation, and when you're talking about some of the trickiest, most complicated experiments ever carried out, that's hugely important. "Based on the current Tevatron data," says a paper describing the new analysis, "and results compiled through December 2011 by other experiments [meaning the LHC], "this is the strongest hint of the existence of a Higgs boson." Swell. So why is any of this important and what, for that matter, is the Higgs boson? The answer has to do with the masses of various subatomic particles, and those vary wildly. Protons are more massive than electrons, for example, and electrons are way more massive than neutrinos. Photons have no mass at all. For most us, that's no more than a fun fact (and not all that much fun, really). For physicists, though, it's a mystery that demands a solution. Why are the masses so different  and why do any particles have any mass at all? The answer, suggested several scientists back in the 1960's, is that the entire universe is suffused with a sort of energy field  it's called the Higgs field, after the Scottish physicist Peter Higgs who first decribed it. The Higgs field is something like a cosmic molasses, and as particles slog through it, the resistance they encounter is what we measure as mass. Since stars, planets and people are made of those particles, the Higgs field is why we have mass as well. For the Higgs field to do its magic, it has to ping the protons, electrons and the rest with its own proprietary particle known as the Higgs boson. If you can't find the boson, you can't prove the existence of the Higgs field  and if you can't prove the Higgs field, you can't explain where mass comes from. So detecting the boson is no minor thing. To find the Higgs, you need a powerful accelerator that creates exceedingly powerful  if exceedingly tiny  explosions: the particles that condense out of the resulting blast of energy might just contain a Higgs or two. In December, two different detectors at the LHC, just outside Geneva, saw some evidence of the appearance of the Higgs  in the form of so-called "bumps" in the data at around 124 or 126 billion electron volts (that's the unit of mass when you're talking about particles; a proton's mass is about a billion electron volts). This is in the range in which theorists suggested the Higgs might indeed be found, and while the detection wasn't considered definitive, it was at least highly suggestive. The new report out of the Tevatron boasts a bump as well. The American version isn't as clear as the Europeans' due to the accelerator's relative weakness: it was somewhere between 115 and 135 billion electron volts. But since that's consistent with what the LHC saw, it bolsters the case that the Higgs may have been snagged at last. The Tevatron won't be able to help much after this; the new analysis was pretty much the last heroic gasp of the out of the venerable machine. But plenty of Fermilab physicists are involved in LHC experiments all the same: the European machine even has a remote control room located at Fermilab headquarters. And while Tevatron has wound down, the LHC is just getting started. It's ramping up its power for the next round of proton-smashing, so if the Higgs is really there  as physicists are now increasingly confident it is  the signal should continue to get stronger and stronger until it's incontrovertible. That may not take long, either. "I don't think there's any place for the Higgs to hide," Fermilab physicist Rob Roser told the Associated Press. "We'll know the answer one way or another by the end of 2012."